Are you looking to open your own CrossFit gym but do not know where to begin? We developed this infographic with entrepreneurs like yourself in mind. Opening a CrossFit gym seems simple on the surface, but there is actually much more to opening one than it seems. CrossFit can be an amazing business venture with a high return, making it an enticing opportunity for anyone into fitness. Not sold? There are currently 13,000 CrossFit gyms spread across more than 120 different countries. It’s undeniable that CrossFit has quickly become a global phenomenon and is not showing any signs of slowing down. As long as people are interested in fun workouts, CrossFit will have its place. To that, more and more people are becoming active. CrossFit has even done an amazing job of capturing female interest. But, before you start earning any money in CrossFit, you first have to learn the basics. 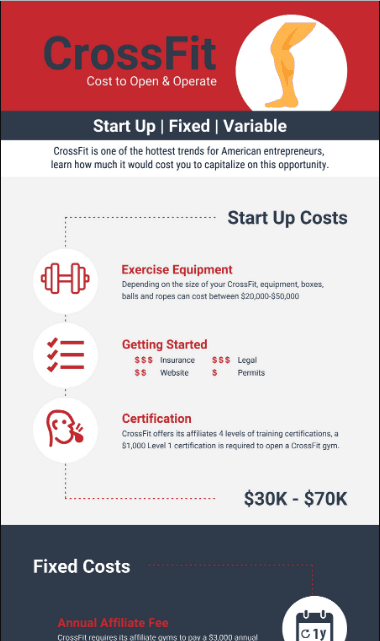 This infographic breaks down the costs of opening one, including the startup costs, ongoing costs, and variable costs. How to Improve Your Sales Process?